Collins? Stewart? Milburn? Chan? Who can say? 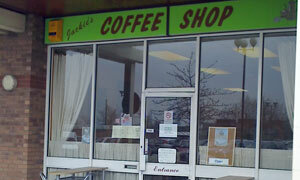 At Jackie's Coffee Shop, by their first name only shall ye know them. Hadn't heard of this particular cafe until a tip-off from Kev, who I'm sure would have joined us had it not been for his intravenous drip: get well soon, KC. His Doc wouldn't advise it, but crane your neck here and you'll glimpse the dock cranes, plus the unlamented Anzani House. For Jackie's, as the menu says, is next to Morrison's. Don't wait for a waitress: in keeping with the Cliff Top, a sign shouts Counter Service Only. There's a lower-case dinnerladies feel to the place, and that's a good thing. Anne Reid took my order for ham 'n' double egg 'n' chips 'n' banana milkshake, then brought it out in double quick time. I'd barely had the time to register the many coffee sacks adorning the wall. Straight from Colombia to Felixstowe: I bet that name sounds dead exotic in Medellin. Must mention the free to browse newspapers. Best selection yet, from broadsheet to redtop to loo-cal news. Tasty savoury (doused with sugar-free ketchup) dispatched, returned to browse the pudds. Trifle was tempting but lost out to an appealing super sponge coated with 100s of 100s & 1000s. Other lady -- Bren Furlong -- also did me proud in producing an off-the-menu white Americano: strong, no foam. And, despite being busy taking other orders, she took the time to check back with me that everything was in order. There's service for you. If it was a car -- Renault Clio. If they were passing by -- Duncan Preston.